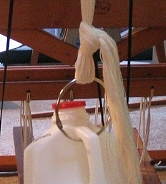 This first photo is for Carol, who was interested in how I attached the 1/2 gallon milk jug weights to my warp bouts. I've done a lot of experimenting with this and for me, the slip knot & s-hook method has been the easiest. The s-hooks are the heavy dutiest (is that a word???) ones I could find at Home Depot. I've also tried shoe laces and the large rings found in embroidery kits. But I like the s-hooks the best. The milk jugs have worked well, however they are not without their hazards, especially if one has cats. Check out what happened in these posts, "Undulating Shadow Weave 1" and "A Weaving Setback", to see what I mean. Laritza uses dumb bells as weights, something that is still on my list to try! ...... which is in front of the shafts. This leads me to a true confession - this latest warp hasn't gone on without it's glitches! For my Schacht Mighty Wolf, I use one of Deb Chandler's methods, which marks the raddle groups (pictured at right) at the end opposite the threading cross. The raddle groups are dropped into the raddle, which is placed on the back beam. (Photo here) After the warp has been wound onto the warp beam, the cross remains at the front of the loom, ready for heddle threading. Well, when I carried this six yard long chained warp to the loom, I realized that the raddle groups were at the "wrong" end, i.e. the opposite end from the threading cross. So I had to put the raddle at the front of the loom, where the raddle groups are. At first this worried me, as I thought I needed it behind the shafts to thread the heddles. However, I remembered that, in the set-up video, the raddle is removed completely and the individual warp ends are picked out from the cross for threading. So alls well that ends well. 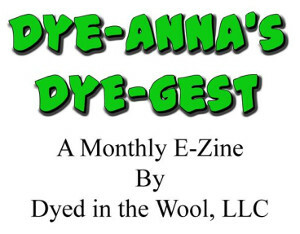 I realize that this may be a somewhat confusing post, certainly for the nonweaver, but probably for weavers too. Fortunately not a lot of things in weaving are written in stone. We have our preferred ways of getting results, but thankfully there are back-ups if needed. And I certainly needed one here. I finally found the larger S hooks at Home Depot. Last warp worked out perfect. The new one will be tied on. Don't you just love it when things start to work without too much hassle and you "know" what to do if something goes wrong? Leigh, thank you for the visit and comment and thank you for the photos. Now it is clear. Today I will play with some fishing line to see if it will work there also. But one photo leads me to another question...well two actually, are those home made raddles? and how does one attach to a baby or mighty wolf beam as I have a recently acquired a used baby wolf and as I like to warp back to front it is different, maybe sticks going from beam to beam then attach the raddle? And yes to Laritza's question about "knowing". Great post. I learned sectional warping years ago and haven't looked back! It is so fast and accurate that I saved time, mucho time! 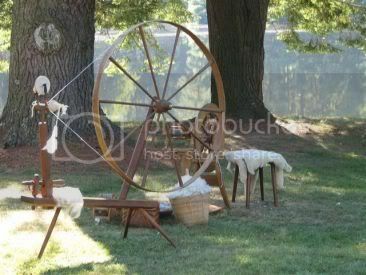 In fact, when I got my Mighty Wolf...I got a VERY good deal on it's cost by teaching the shop owner how to warp sectionally. She was absolutely amazed. Nonweaver here....just saying, I didn't find the post confusing...on the contrary, I found it to be intriguing! Good post! I warning about the bottles. I use bottled spring water for my iron. I buy the large size like you use for your warps. A bottle lasts a long time. But, after awhile they develop these strange leaks. I can never find the source. Nor can I figure out why. It is most irksome. Thanks so much for the weaving tips on warping. 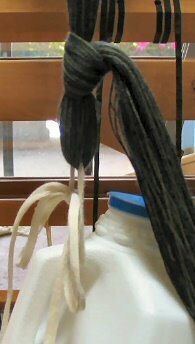 I've never used milk jugs to tension my warp. In fact I've never used any tension to warp my loom but I certainly am going to give the milk jugs a try on my next warp.